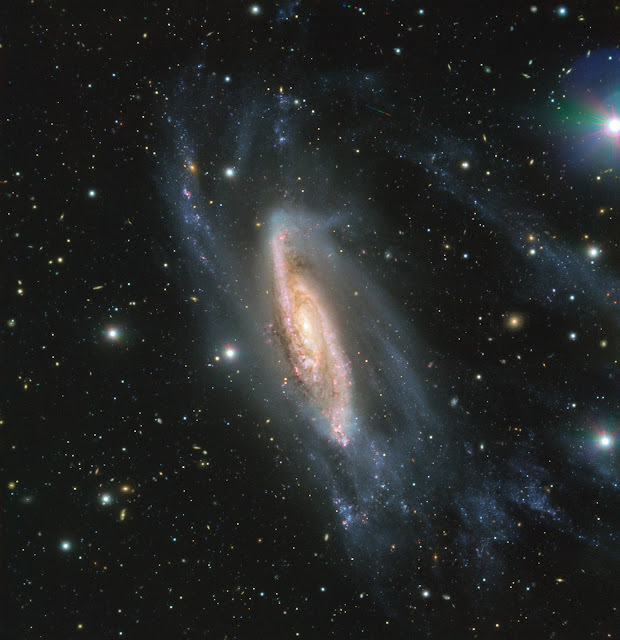 FORS2, an instrument mounted on ESO’s Very Large Telescope, has observed the spiral galaxy NGC 3981 in all its glory. The image was captured as part of the ESO Cosmic Gems Program, which makes use of the rare occasions when observing conditions are not suitable for gathering scientific data. Instead of sitting idle, the ESO Cosmic Gems Program allows ESO’s telescopes to be used to capture visually stunning images of the southern skies. FORS2 is mounted on Unit Telescope 1 (Antu) of the VLT at ESO’s Paranal Observatory in Chile. Amongst the host of cutting-edge instruments mounted on the four Unit Telescopes of the VLT, FORS2 stands apart due to its extreme versatility. This ”Swiss Army knife” of an instrument is able to study a variety of astronomical objects in many different ways—as well as being capable of producing beautiful images like this one. NGC 3981 certainly has many galactic neighbors. Lying approximately 65 million light years from Earth, the galaxy is part of the NGC 4038 group, which also contains the well-known interacting Antennae Galaxies. This group is part of the larger Crater Cloud, which is itself a smaller component of the Virgo Supercluster, the titanic collection of galaxies that hosts our own Milky Way galaxy. This image was taken as part of ESO’s Cosmic Gems program, an outreach initiative to produce images of interesting, intriguing or visually attractive objects using ESO telescopes, for the purposes of education and public outreach. The program makes use of telescope time that cannot be used for science observations. In case the data collected could be useful for future scientific purposes, these observations are saved and made available to astronomers through ESO’s science archive. ESO is the foremost intergovernmental astronomy organisation in Europe and the world’s most productive ground-based astronomical observatory by far. It has 15 Member States: Austria, Belgium, the Czech Republic, Denmark, France, Finland, Germany, Italy, the Netherlands, Poland, Portugal, Spain, Sweden, Switzerland and the United Kingdom, along with the host state of Chile and with Australia as a strategic partner. ESO carries out an ambitious programme focused on the design, construction and operation of powerful ground-based observing facilities enabling astronomers to make important scientific discoveries. ESO also plays a leading role in promoting and organising cooperation in astronomical research. ESO operates three unique world-class observing sites in Chile: La Silla, Paranal and Chajnantor. At Paranal, ESO operates the Very Large Telescope and its world-leading Very Large Telescope Interferometer as well as two survey telescopes, VISTA working in the infrared and the visible-light VLT Survey Telescope. ESO is also a major partner in two facilities on Chajnantor, APEX and ALMA, the largest astronomical project in existence. And on Cerro Armazones, close to Paranal, ESO is building the 39-meter Extremely Large Telescope, the ELT, which will become “the world’s biggest eye on the sky”.